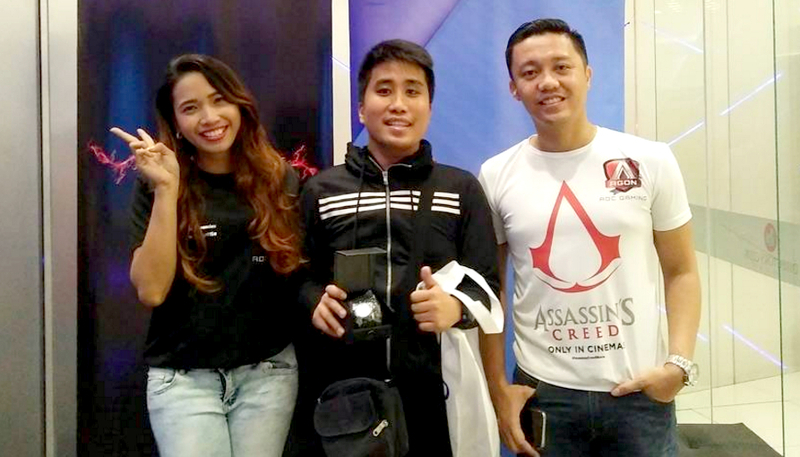 On Thursday - January 12, 2016, leading display technology company AOC and top-notch global entertainment company Twentieth Century Fox (FOX) started the year right by treating both gamers and non-gamers to the block screening of “Assassin’s Creed” The Movie at the SM MegaMall Director’s Club. Pinoy computer gamers, tech bloggers, digital influencers, and other media friends thoroughly enjoyed the flick, which is based on a very popular action-adventure stealth video game. Ms. Mimi Navarroza - AOC Marketing Officer, Mr. Val Marvin Macanas - TechPinas Representative, and Mr. Jack Salamia. AOC Philippines' Marketing Manager Mr. Jack Salamia welcomed the guests and likewise took the opportunity to introduce the AOC AGON monitors to them. AGON, AOC’s premium gaming monitors brand, continues to lead the competitive computer gaming world, providing users with the best gaming visual experience possible. It rained freebies at the venue for the loyal partners who graced AOC's invite! Each guest received either a Rudy project wrist watch or an Omega Crosby Tumbler at the “pick-a-prize” booth c/o the brand. On top of that, two lucky guests won a Rudy Project luggage and an AOC monitor in the raffle -- showing the company's clear appreciation for gamers, bloggers, and the media. Complete with La-Z-Boy seats, burgers, and unlimited popcorn and drinks, guests enjoyed the VIP treatment and had the most comfortable 'Assasin's Creed' movie night. The flick which started at 7:30 PM ran for almost two hours. What a treat! With this intimate get-together, AOC AGON has once again marked its spot in the world of computer gaming here in the Philippines. Looking forward to gracing more events by the company soon.